One of the oldest civilizations in the world in one of the poorest and most troubled countries of the Middle East is facing a tough cultural crisis. Yemen, which extends over a surface area of 528,000 square kilometers (204,000 square miles), abounds with the antiquities of various cultures, the oldest of which dates back 3,000 years. The civil war that the Arab coalition, led by Saudi Arabia, is participating in, alongside President Abed Rabbo Mansour Hadi’s government, is a scar in humanity’s civilization. 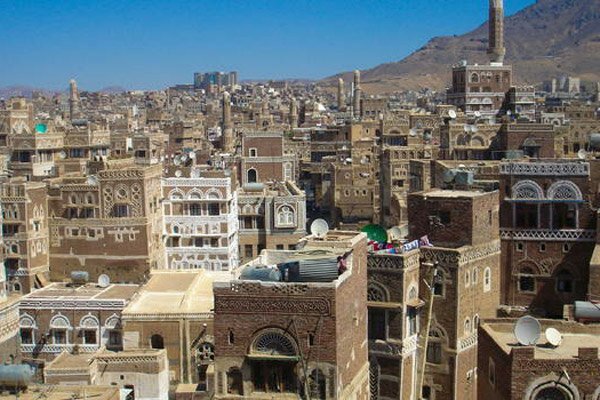 An overview of the Old City of Sanaa that is on the UNESCO’s World Heritage List shows the extent to which the city and its heritage have been tarnished by the missiles of fighters. Over 6,000 historical houses whose renovation dates back to nine centuries have been reduced to remnants and occupy a surface area on which five houses were built before an Arab coalition missile hit them. In mid-June 2015, Saudi-led military coalition airstrikes bombed the historic al-Qasimi neighborhood in Sanaa’s city center, destroying five historic houses. Irina Bokova, director-general of UNESCO, said in a statement published June 12 that she was distressed by the damage done to the oldest jewels of Islamic civilization and called on all parties to keep the heritage sites out of the circle of conflict. 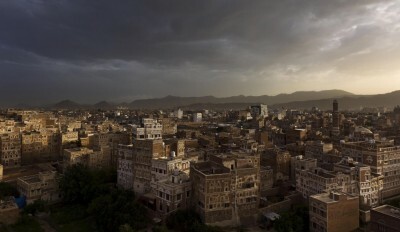 The neighborhood is one of dozens of historic archaeological sites in Yemen destroyed by the coalition airstrikes and local attacks resulting from the armed conflict between supporters of Hadi, the internationally recognized president, and the armed Houthis and their ally, former President Ali Abdullah Saleh. The country known historically as “Arabia Felix” (in Latin), meaning happy Arabia, is no longer as fortunate, facing a threat of destruction of its history and heritage. On Sept. 19, the airstrikes hit al-Falihi neighborhood and killed 10 members of the same family: Hafaz Allah Ahmad al-Ayni, his wife, Houria Saad al-Hadid, and their children Nassim, Ahmad, twins Maria and Maram, Mohammad, Ali, Malak and Yehya. The shelling destroyed yet another historical house and damaged a number of nearby houses. On Nov. 21, the Islamic State claimed responsibility for the blast near the archaeological old walled city of Shibam, in eastern Yemen’s Hadramawt province, 990 kilometers (615 miles) from the capital Sanaa. The blast that targeted a military checkpoint of Yemeni troops wreaked havoc in the city that dates to the 16th century and is famous for its fenced mud-brick high-rise buildings that rise up to more than 30 meters (98 feet) in the middle of a vast desert. Shibam, known as the “Manhattan of the Desert,” is a haven for desert tourism lovers. Inhabited by 7,000 people, the city includes about 500 buildings from five to 11 stories. It was included in the list of UNESCO World Heritage Sites in 1982. In the southern province of Taiz, two prominent historical landmarks were ravaged by the internal armed conflict, ongoing in the province for nearly a year now. On Feb. 3, the National Museum in Taiz came under artillery fire. The museum, which includes rare manuscripts and pre-Islamic and traditional artifacts, was almost completely burned. The Cairo Citadel, built a thousand years ago, was ravaged by the aircraft shelling that targeted it more than once. The Houthi forces, officially called Ansar Allah, backed by troops loyal to Saleh, seized the historic citadel and its fortified fence in March 2015. They set up cannons to bombard the city and the sites affiliated with the Popular Resistance loyal to Hadi, which turned the city into a target for the Saudi-led coalition airstrikes. The historical Marib Dam was hit by an air raid on May 31, 2015, which destroyed ancient Sabaean inscriptions carved on its walls. Marib province is located to the east of the capital Sanaa and was the largest ancient city in the south of the Arabian Peninsula. The city hosts many important cultural landmarks such as Bran Temple, Awam Temple and Cemetery and Marib Dam, which is considered an architectural wonder. These cultural landmarks are all included in the World Heritage Sites in Yemen. Al-Qaeda in the Arabian Peninsula, which controls the southern city of Mukalla in Yemen, destroyed on April 2, 2015, a number of Sufi shrines and domes built in 1158, alleging that these shrines promote polytheism. The destruction of a number of unique cultural heritage landmarks in Yemen caused the country to lose an important part of its civilization and creative legacy. The monuments that remain standing are struggling to survive. UNESCO in July 2015 included Sanaa and Shibam on its list of endangered World Heritage Sites, thereby sending a message to the warring parties to stop destroying history and sounding the alarm that those areas are under threat of destruction. Ahmed Alwly is a Yemeni journalist based in Sanaa. He has covered a wide array of political, social and security issues and conflicts in Yemen since 2009. He also worked as correspondent and editor for several Arab and Yemeni websites.